Northwestern hangs on for HUGE early season road win! In what has been an up and down roller coaster ride the past 3-4 seasons, as the Northwestern Men’s Basketball team continues to keep my heart rate at an all-time high, the Cats were able to secure a huge early season win Tuesday night. We have come as close as 1 win away in 2010-2011 and 2011-2012 to emerging from the exceptionally small pack and getting our name announced during the Selection Sunday Show – becoming the first program in Northwestern history to make the “Big Dance.” A dream that many Northwestern fans throughout the world continue to hope and pray will happen in 2012-2013! The Wildcats traveled to Waco, TX Tuesday evening to take on the Baylor Bears and their tremendously athletic team. Coming off of a disappointing loss to the University of Illinois-Chicago (UIC) this past Saturday, the Cats bounced back fiercely and clawed their way to a HUGE road win early in this 2012-2013 campaign. Only connecting on 2-7 free throws down the stretch kept Baylor in the game but Northwestern was able to make the plays to finish off the Bears – giving Coach Bill Carmody the victory and a much more enjoyable plane trip back to O’Hare in Chicago. The one downfall for Northwestern throughout the years has been steady play during the course of the season. From start to finish, the Cats need to keep the momentum going from wins such as Baylor and carry that into the game Saturday night against an up-and-coming Butler Bulldog team. The Bears came off of a huge win earlier in the week against the previously #2 ranked team in the country, Kentucky, but let their guard down against the “Purple” Wildcats! We cannot allow that to happen Saturday. Drew Crawford, Dave Sobolewski, and Reggie Hearn continue to lead the Cats in all facets of the game. The addition of Jared Swopshire has made the Cats a real contender this year in the Big Ten. Swopshire graduated from the University of Louisville in 2012 but because of injury (missing an entire season) was granted an additional year of eligibility by the NCAA. Luckily for the Wildcat community, he chose Northwestern University as his school of choice to continue his education. Let’s make it 8-2 Saturday night. GO CATS!!! As Thanksgiving rapidly approaches, the Northwestern football team will look to finish an incredible year by defeating Illinois in Evanston next weekend. If it were not for 2 extremely close losses (Nebraska and Michigan) and a tough defeat at Penn State, the Wildcats could hypothetically be playing for a spot in the National Championship game. Unfortunately that is not the case but the Cats will be playing for an opportunity to compete in a very high-profile bowl game, possibly the Gator Bowl on New Year’s Day. If they were to venture to Jacksonville for the Gator Bowl, I can ensure you I will be there supporting and cheering on our Wildcats! Let’s hope they can finish the season strong and end with one of the program’s best records in recent years. The Northwestern Men’s Basketball team is off to a fast start, 2-0, defeating Texas Southern and Mississippi Valley State. They will look to maintain their undefeated record this week before heading to the South Padre Island Invitational over the holiday weekend. After a couple close calls the prior 2-3 years, the Wildcats will look to do what no other program in the history of Northwestern Basketball has accomplished…finally earn that inaugural birth to the NCAA Basketball Tournament. I am confident that this is the year! Please follow the Northwestern Men’s Football, Basketball, and many other sports teams at www.nusports.com. Kain Colter continues to carry the Wildcats to one of their best seasons in recent years. 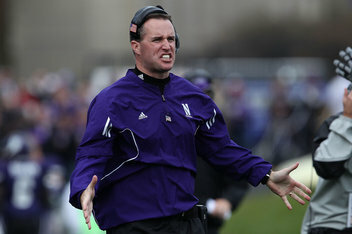 You cannot say enough about Coach Fitzgerald and what he continues to do with the Northwestern Football team. Tough Mudder – Miami 2013 (Saturday March 2) – JOIN US!! !